In the past several years, the accent of a number of scientific researches in the countries of the European Union, USA and Japan was focused on the field of biomaterials. Having the direct influence on the quality and longevity of human life, these researches receive significant funding. The bone tissue is an especially interesting subject of scientific research, as much for the frequent osteoporosis, as for the formative nature of organism. Natural bone is mostly composed of nano-crystalline (Nc) and nano-particles (NPs) of calcium phosphates. Synthesis of Nc and NPs calcium hydroxyapatite and composites for the reconstruction of bone tissue has been the chief research field of a section of Advanced Materials and Processes Department of the Institute of Technical Sciences of the Serbian Academy of Sciences and Arts (ITS SASA) in Belgrade. Apart from a significant number of scientific papers published in leading international journals, lectures presented at the leading universities worldwide, several PhD dissertations defended at various faculties in the land, and several domestic patents, Prof. Dr. Dragan Uskoković and Prof. Dr. Nenad Ignjatović and their research team have already attained the capacity to produce small series of various products developed in their laboratory. 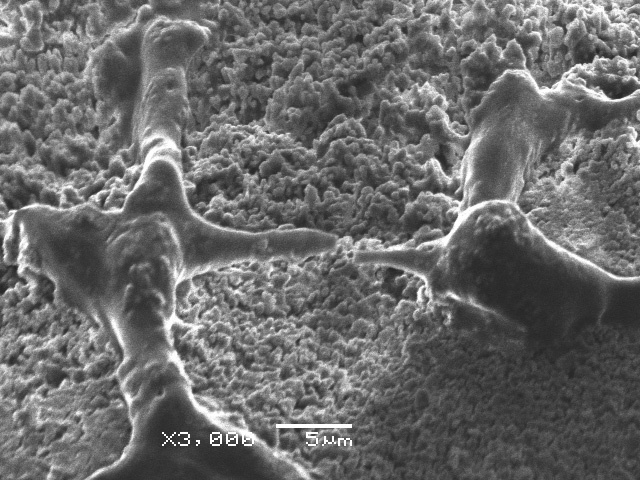 Prof. Dr. Nenad Ignjatović (Institute of Technical Sciences of the Serbian Academy of Sciences and Arts), explains how this material and other biocompatible polymers were used for the synthesis of the composite biomaterial which can be rightly dubbed the “artificial bone” – the bone that, thought artificially synthesized, has not only almost the same chemical composition as natural bone, but also has the same structure, mechanical properties, porosity, etc. The concept underlying this biomaterial and implants based on it is an entirely new and different from all known concepts. To put it simply, after the implantation, this “intelligent material” becomes “alive”, it attunes itself to the needs of the organism and its metabolism, and finally disappears (dies), replaced by a newly formed tissue. It is composed of a non-bioresorbable component (hydroxyapatite and tricalciumphosphate), needed by the organism, and of a bioresorbable polymer component. In the course of time, the polymer gets resorbed and disappears, whereas the final products of its degradation – water and carbon dioxide are entirely harmless to the organism. The polymer disappears simultaneously with the formation of new organic tissue; at the end of the reparation process, the place of the polymer is taken by a new tissue generated by the organism. The implant allows tissue proliferation. To put it simply, the repair tissue becomes alive, interlaced with blood vessels, and involved in the normal metabolism of the surrounding tissue. According to Prof. Dr. Nenad Ignjatović, after a period of time, the place once occupied by the implant made of this biomaterial, i.e. the repaired segment of the tissue, is almost indistinguishable from its surroundings. The reconstruction process can also be speeded up. The material may incorporate certain growth factors. For example, in a certain type of fracture which normally takes about two months to heal, growth factors may reduce the healing time almost by half. This ensures a higher quality of life for patients during and after the intervention. The synthesis process of this composite allows to design its chemical and mechanical, as well as biological properties, which broadens the possibilities of this procedure. The concept underlying the structure and properties of natural bone has been applied to this basically artificial but in all respects “natural” bone. However, it took years of hard work to pass the way from the initial idea to its accomplishment. These researches have very wide aspect of significance – from fundamental, scientific, to specifically applicative. We may say that they include everything from synthesis, processing and characterization, to their application. The first stage of the study included pre-clinical research carried out on cell cultures. 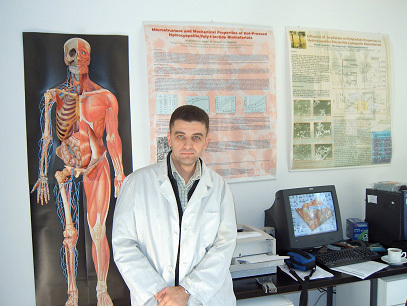 In his researches done at the Faculty of Stomatology, University of Novi Sad, and the Institute of Oncology in Sremska Kamenica, Dr. Petar Ninkov (Faculty of Stomatology, University of Novi Sad) affirmed the significance of these biomaterials and drew attention to their possible applications. The experimental study carried out on human cell cultures (Fig. 2) confirmed a high potential of the application of these biomaterials. Their cytotoxicity level was significantly below that observed in other biomaterials. As it is presented in Fig. 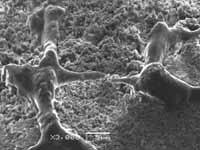 2, fibroblast cells “found” this biomaterial’s surface ideal for their development. In her research carried out on a large specimen of experimental animals, Dr. Zorica Ajduković (Faculty of Stomatology in Niš) confirmed the applicative qualities of these materials. After the advantages of the application of these biomaterials had been successfully confirmed by pre-clinical studies, the researchers proceeded to their application in clinical conditions. Synthesized biomaterial was applied in the treatment of bone tissue deficiency brought about by advanced resorption of alveolar bone in systemic osteoporosis. The results of the study have shown that the application of this composite biomaterial in the reconstruction of an alveolar bone affected by osteoporosis (Fig. 3a) leads to an increase in the density of the alveolar bone; the quality of prosthetic supporting tissue is satisfactory and it can bear the load of inserted dentures (Fig. 3b). In short, the application of the biomaterial results in an enhancement of healing process in post-extraction wounds and a decreased need for additional interventions. It enables the creation of new bones which are very similar to natural bone tissue, induces osteogenesis and prevents resorption. Such a reconstruction fully meets both aesthetic and phonetic requirements. Prof. Dr. Vitomir Konstantinović of the Faculty of Stomatology in Belgrade has studied the applicative possibilities of these biomaterials as fillers, which can be conveniently applied in the reparation of various bone defects in maxillofacial surgery, and their application in combination with growth factors, resulting in a faster osteogenesis process. Biomaterials in the form of fillers are highly convenient for practical application; easily handled, they make a surgical intervention easier and simpler, whereas the final goal is achieved in considerably shorter time. The use of soft-lasers (the so called low-intensity or low-energy lasers) has made a significant contribution to modern medicine. The increasing application of their beneficial effect in various therapeutic procedures is obvious. Low-energy lasers have powerful biostimulative effect reflected in more vigorous cell metabolism and microcirculation, resulting in an increase in mitosis of epithelial, connecting tissue and bone cells (Fig. 4). The application of soft lasers in the reconstruction of bone tissue using biomaterials synthesized in the Institute of Technical Science of SASA is the chief subject of the current research conducted by Prof. Dr. Ljiljana Kesić (the Faculty of Stomatology, Niš). The results achieved so far confirm the use of lasers as stimulants in regenerative therapeutic methods and implantation of biomaterials in bone defects. 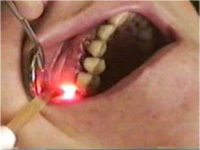 The use of laser contributes to an increased density of bone tissue, diminishing thus the possibility of undesirable processes. “The research conducted within our Institute yielded outstanding results – in terms of scientific considerations, as well as in terms of an unquestionably positive biological response of the organism to the implantation of this biomaterial, confirmed in a series of clinical researches”, says Prof.Dr. Dragan Uskoković, Director of the Institute of Technical Sciences of the Serbian Academy of Sciences and Arts. According to him, the most serious problem is related to inability to transfer the knowledge and production methods to domestic institutions and organizations. “Attempts have been made to establish cooperation with international institutions, but they were accompanied with problems concerning intellectual ownership and registration of products. We are aware that this is an outstanding material developed with changeable success by numerous scientists all around the world and we know that our capacity is immense, which encourages us to persist in our endeavours”, concludes Prof. Dr. Uskoković.